Kneel before Sharingan Sand Monk by Kaiju One! 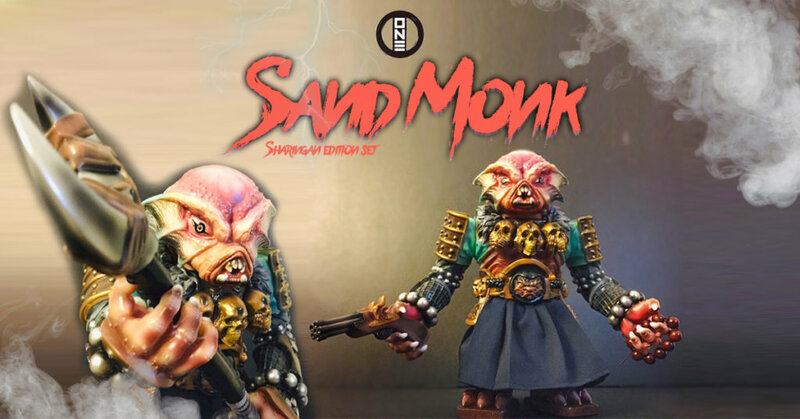 back from the 10000’s of battles KAIJU ONE now proudly presents their latest 11-inch soft vinyl toy figure:- THE SAND MONK Sharingan edition Standing proudly at 27 cm height. Sandy is the third member of the team with Super Sun Sun and Porky. We had the chance to check the bad boy out at DesignerCon last year and now Kaiju One is offering you the chance to own one with a lotto entry! Joining the crew with last years hit SuperSunSun and Porky. Looking at Sand Monk we class ourselves as beautiful and Sand Monk would give Predator a run his money at a beauty pageant, HA. Anyway less rambling, here are the details on how you can own one, or at least have the chance to own one. Below the LIVE stream where you can check him out. THE SHARINGAN SAND MONK SET（Sharingan Sand Monk Plus Kaiju One 2019 T-shirt) ! The Sharingan Sand Monk will come with the (a) Textile Sarong ; （b) steampunk gun , (c) crocodile mouth , (d） Buddha Beads , （e) Crescent Shovel And (f) Straw Hat . Lottery Sales will start from 1 Feb 2019 ( NOW ) to the end of 4 Feb 2019 ( Hong Kong time )! Winner will be informed by 6 Feb 2019. Item will be shipped out by mid February 2019. Result will be sent to winners by 6 Feb 2019 through email. Winners qualification will be cancelled if there is no settlement within 3 days upon announcement.